Barbara Guarischi has sprinted to victory in the opening road stage of the Giro Rosa in Ljubljana, Slovenia today. Guarischi finished ahead of Lucinda Brand (Rabo-Liv) and to cap off a great day for Velocio-SRAM, her teammate Tiffany Cromwell sprinted to third. The 102.5 kilometre Stage One from Kamnik to Ljubljana city was one touted for the sprinters but it was not a flat stage that greeted the peloton. An early break of three riders: Ana Covrig (BePink La Classica), Malgorzta Jasinska (Alé Cipollini) and Chantal Hoffman (Lotto Soudal Ladies) were away after the first intermediate sprint at 12 kilometres. A seven kilometre climb mid-race split the peloton and at that point, Covrig and Jasinska became a duo that continued to work together until they were caught by the peloton with six kilometres to the race. The teams then became organised for their sprinters and it was Velocio-SRAM that were able to deliver the Italian sprinter Guarischi to the finish. In the overall classification, Brand now moves into the Maglia Rosa with a four second lead over Guarischi, and five second advantage to Annemiek Van Vleuten (Bigla Pro Cycling) who won last nights prologue. Stage Two returns to Italy with a start in Gaiarine and finish in San Fior for a 121 kilometre stage. 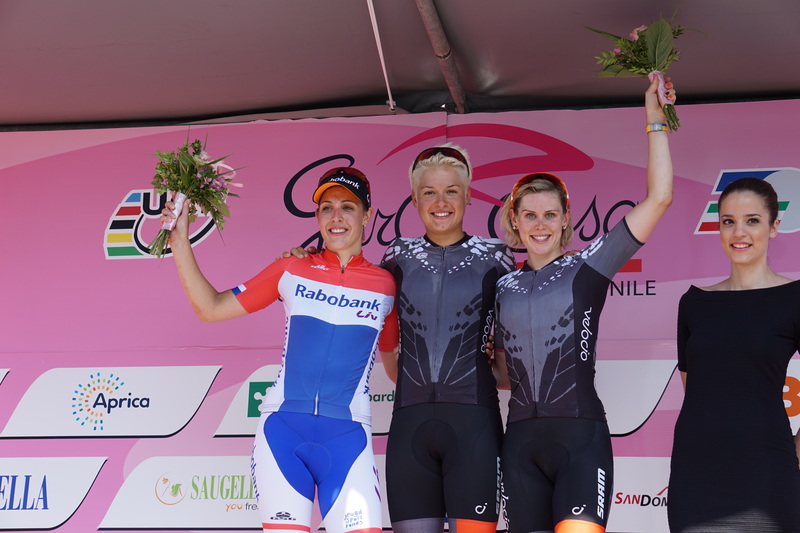 Live action can be followed on the team’s twitter account @velociosports, with #GiroRosa2015 and Rai Sport 2 have an evening highlights broadcast televised daily.